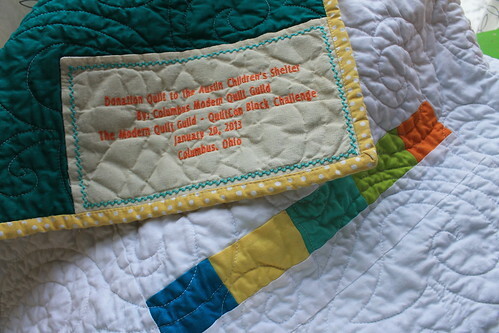 As part of the QuiltCon Block Challenge hosted by the Modern Quilt Guild - Columbus Modern Quilt Guild received a set of blocks made across the country to turn into a charity quilt for the Austin Children's Shelter. Thanks to Kathy and Barb for coordinating all the efforts and to everyone who pitched in on the quilt (especially Catie's amazing quilting!) Here are a few shots of the finished quilt, bound and washed and ready to be shipped to Austin! More pictures in our Flickr Group. 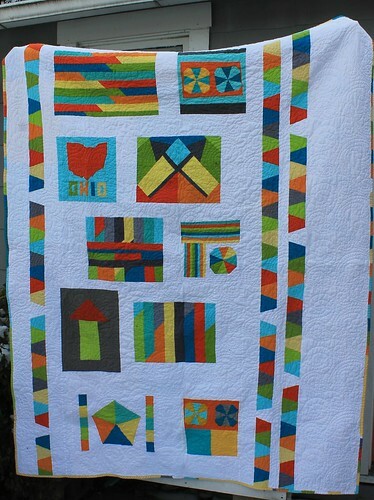 The quilt will be displayed at QuiltCon - maybe we'll get a picture of it there! It's beautiful! I love the strips of wedges that echo the colours of the solids in the blocks!